Haworth Improv Task Chairs. 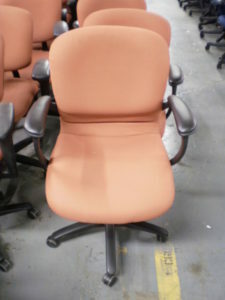 Salmon colored fabric with black plastic shell and arms. 3 arm styles: (15) with a pointed T-arm, (4) with a flat T-arm and (4) with a loop arm. Good as-is conditon with light cleaning. These chairs can be reupholsered in black fabric. 1 Comment on "Haworth Improv Task Chairs"